Commanded the Confederate Army of Tennesse. 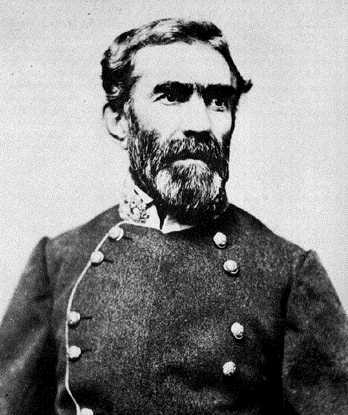 Braxton Bragg was a talented and brave soldier whose merits took him to high rank; his drawback was that he made enemies easily. He was a North Carolinian, a West Pointer (class of 1837) and a Mexican War veteran. He served with the artillery, bringing horse artillery ideas and effectiveness to the United States Army. He won three brevets (so he had the authority of a Lieutenant Colonel, but was paid as a Captain) for his service, almost always at the front. He'd also seen service in the Seminole Wars, but resigned in 1856 to become a Louisiana planter. He was prominent in the Militia, being a Colonel and then Major General even before the Civil War reached his adopted state. For a few weeks he was in charge of Confederate forces in Louisiana, but was moved to the Pensacola area, where a large Confederate force was forming, trying to force the Union garrison out of the forts that blocked the port. He was there for nearly a year (March 1861- February 1862) and earned a reputation as a stickler for discipline and a strong trainer of men. His disciplinary reputation was deserved (he was rumored to have forwarded letters of complaint to himself when he held two overlapping positions) but his men weren't as well trained as the forces in Virginia. From west Florida he moved to northern Mississippi, taking charge of the forces assembling for the attack at Shiloh until relieved by A.S. Johnston. He led a Corps during the battle, afterwards being promoted to full General for his role in it. With Johnston dead, Beauregard was in command of the army, but he fell ill and Bragg assumed command. The army had fallen back to Corinth after its defeat at Shiloh, and when Halleck moved towards the Confederates with overwhelming force Bragg had to retreat. But Halleck moved so slowly that Bragg evacuated Corinth at his leisure, and got all stores, supplies, and men away. Bragg moved onto the offensive, moving through east-central Tennessee into Kentucky, trying to lever the Union forces out of central Tennessee, and also rally Kentucky for the Confederacy. They moved north without much resistance as the Union forces moved to react to the unexpected incursion. But Bragg lacked the strength to make good on the threat. South of Cincinnati and Louisville his advance was checked by Buell at Perryville in a medium-sized battle because Bragg didn't employ all his men. The Confederates fell back into Tennessee, reorganized and re-supplied, and planned to go into winter quarters around Murfreesboro. William Rosecrans had other plans, and led his army out of Nashville on a winter campaign. On the last day of 1862 Bragg attacked the Union right flank, but couldn't break through. The battle was renewed on January 2nd, 1863 and again Bragg made some progress but not enough. He had to retreat from Tennessee but was pinned in the Tullahoma area by the threat of Rosecrans' army. He couldn't beat Rosecrans, nor could he detach major forces to help around Vicksburg. Rosecrans finally took the offensive, and pushed Bragg back a little, then took the opportunity to move on Chattanooga. He took the city, but Bragg counterattacked the Union forces at Chickamauga. While he routed two-thirds of the Union forces, the rest held and covered the retreat; Bragg was not successful in outflanking George Thomas' force and didnt turn the tactical victory into the destruction of the Union Army of the Cumberland. The toll was very high, over 15,000 total casualties for each side, in the Confederate's only major victory in the western theater. Bragg's character didn't help either. He didn't follow up his success, but merely observed the Union forces penned up in Chattanooga. They were slowly starving, inadequately supplied over roads that Nathan Forrest was harassing, but Bragg spent his time quarrelling with his subordinates (Polk, Longstreet, Hardee, and others about the only man Bragg didn't quarrel with was Jefferson Davis) rather than pursuing his advantage. Grant took the opportunity handed to him to re-open the supply lines, then launched an attack up Seminary Ridge that unexpectedly broke Bragg's line. The whole fruits of Chickamauga had turned to ashes. Bragg couldn't be kept on as an army commander, but Davis protected him, appointing him as an advisor. He couldn't do much: in the eastern theater the real decisions were always made by Lee, and the western commanders had the advantage of distance when they disagreed with orders from Richmond. Eventually he stopped twiddling his thumbs and went to North Carolina, but he didn't do much to bolster Fort Fisher and the second Union attack succeeded. The Confederacy was now without a single major port, and Lee's army was starving that much faster. In early March 1865 Joe Johnston took command in North Carolina, since he had the only sizeable force there. Bragg, from being commander of all Confederate forces in the west was reduced to overseeing Hoke's single division of North Carolinians. The only result was that he had to surrender the division instead of Hoke. After the war he moved to Alabama, putting his engineering knowledge to work, then moved on to Texas.